At present, one needs only to mention the early western businessman to evoke images of a Horatio Alger-type figure. Robert McDonald’s work on Vancouver’s elite has helped to revise our understanding on this subject. He has argued that old wealth transported from other urban centres played an important role in shaping Vancouver’s social structure. This article sets out to add to a revisionist interpretation of the western business elite by examining the development of Winnipeg’s elite from the 1870s on into the 1930s. Essentially, this article tells the story of a handful of Winnipeg’s most prominent businessmen, examining their economic interests, and how they developed and changed over time. This article also examines the social, cultural and political world of these businessmen. In this way, this article attempts to construct a collective biography of Winnipeg’s early business elite. The businessmen discussed in this article were those who were most significant in Winnipeg’s financial and industrial decision making. After consulting numerous biographical dictionaries, as well as other sources, information on over 300 members of the business elite was obtained, and from this grouping, the relatively small group of businessmen who are discussed in this article have been selected. In the selection of this group, a conscious attempt has been made to provide a representative picture of the elite; as such, the members of the elite who are discussed in this study can be said to be representative of the elite’s general development. Of course, this methodology is somewhat impressionistic, and this article is not any sort of final word on Winnipeg’s elite. What this article does suggest is that historians re-examine the sacrosanct truths about Winnipeg’s early bourgeoisie that have been passed down to us. The orthodox interpretation leads us to view Winnipeg’s early bourgeoisie as, first and foremost, residents of Winnipeg. This line of interpretation pays scant attention to the concept of class, and as a result, the overarching class structure that connected Winnipeg’s elite with a wider Canadian business elite has been neglected. J. M. S. Careless’ claim, that the early business elite became Winnipeggers above all else, is somewhat dubious when one considers how profoundly class impacted the way in which the bourgeoisie experienced life in Winnipeg. The bourgeoisie formed a cohesive enclave in Winnipeg. They shared a common Anglo-Saxon Protestant background, they lived in common residential areas, they went to the same social and cultural clubs, and engaged in the same leisure activities, and they were a politically cohesive group. In a word, Winnipeg’s elite shared a lot more in common with elites in other Canadian urban centres than they did with a substantial portion of the population in their own city; and, indeed, familial and business relationships connected Winnipeg’s elite to other urban elites in Canada, primarily central Canada. Perhaps the last section of this article most emphatically underscores the need to abandon the orthodox interpretation of Winnipeg’s business elite. In this section, we see how pretensions to community responsibility only lasted as long as they were economically viable. When the economy contracted after 1912, Winnipeg entered a period of relative economic decline, but the city’s elite did not, first and foremost, fight to guard their city’s economic stature. Rather, they sought to guard their own wealth within the context of a national economy that was concentrating and consolidating in central Canada. As such, they merged their own concerns with larger central Canadian firms, and some members of the elite moved from the city altogether; as a result, members of Winnipeg’s business elite actually heightened the city’s relative economic decline. In a sense, this should not be surprising, for the elite arrived in Winnipeg because the city offered promising fields of business, and once those fields of business began to wilt, many members of the elite made the rational economic decision, either merging their interests with larger central Canadian firms or leaving the city altogether. This phenomenon is perhaps even less surprising when one considers the extent to which Winnipeg’s elite was already connected to the central Canadian elite. In 1869, the site of Winnipeg was still only a settlement of fewer than 200 people, standing beyond the gates of Upper Fort Garry. However, the following year, with the Canadian government’s acquisition of the Northwest, the small village of Winnipeg embarked on a commercial journey, which, by the early twentieth century, resulted in it becoming the third largest city in Canada. The Canadian government acquired the Northwest intent on creating, as Gerald Friesen stated, “a new ‘investment frontier’ that would open the west and enrich the east in one fell swoop.”  The development program adopted by the Canadian government—the National Policy—sought to impose an agricultural frontier in the newly acquired Northwest that would export grain and other agricultural products to the east, while providing a market for eastern manufacturers. Aboriginal and Metis peoples viewed the Canadian government’s acquisition of the Northwest, quite rightfully, as an encroachment upon their traditional ways of life, and this concern was brought to the fore during the Red River Rebellion in 1869-70. In 1870, the Canadian government sent out a military expedition—the Wolseley Expedition—to impose its authority over the region, which it succeeded in doing. When the troops were disbanded from the expedition the following year, a number of them decided to stay, and engaged in local business. Private William Forbes Alloway opened a cigar and tabacco store and engaged in trading and freighting, operating as many as 6,000 oxen-carts. Charles N. Bell arrived with the expedition as a sixteen-year-old bugler, and in 1871 he gained employment as a warehouse clerk with the firm of Bannatyne and Begg. The following year Bell also engaged in trading and freighting. Winnipeg’s initial growth spawned the formation of numerous local manufactories. Already by 1874, twenty-seven manufactories in the city were in operation; and this figure reached thirty-nine in 1881. This industrial growth was initiated locally, by an emergent group of industrialists. Alexander Brown and Thomas Rutherford established a small planning mill in Winnipeg in the early 1870s—the first planning mill in the West. John McKechnie established Winnipeg’s first foundry in 1874. In 1877, E. L. Drewry purchased and operated the idle Hercher and Batkin Brewery. And, in 1879, the business acumen of Elisha Hutchings was added to the saddlery concern of Stalker & Caswell, as Hutchings bought out the firm’s junior partner. Taken as a whole, these men represented the core of Winnipeg’s early industrialists. 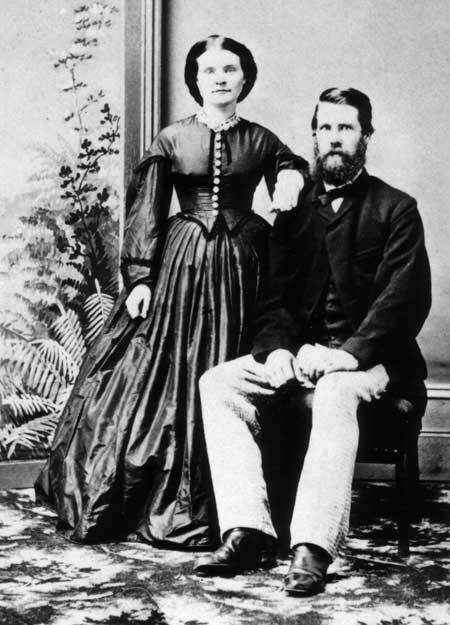 Alexander Brown and wife Margaret Neilson, c1865. The business class of the 1870s was a homogenous ethnic and religious group, being overwhelmingly British and Protestant, and this demographic remained consistent throughout the period under investigation in this article. The economic origins of the business class were, however, not so homogenous. The manufacturers of the 1870s had, to a large extent, come from peculiarly modest means. These men came to Winnipeg as skilled-tradesmen and emerged from the 1870s as manufacturers, propelling Winnipeg’s transition to industrial capitalism, and it is to these men that this paper will now turn. Brown’s reference to “wages” is rather misleading, for he was already beginning to hire labourers. In August 1872, Brown explained to his wife: “We took another contract on Saturday to build 4 houses ... We get 1000 dollars for building them ... We will have to get more men. We have got 3 men now and will have another in a day or two.” Brown then went on to explain that he had been offered a contract to do the carpenter work involved in the construction of a hotel, which would necessitate the employment of “4 or 5 more men to carry on all the work at once.”  The frontier conditions of Winnipeg during the early 1870s appear to have offered skilled-tradesmen like Brown considerable opportunities to achieve social mobility. Indeed, Brown was quite confident that he would accumulate wealth in the future. Brown wrote to his wife, regarding the partitioned home that he and Rutherford were constructing for their families: “I send you a rough plan of the house upstairs[.] ... we are going to brick it up inside ... and plaster both sides of the bricks[.] it will be very warm [.] we will put in board partitions with lath and plaster ... so that we can use it for something else when we get rich enough to build another.”  He would, indeed, accumulate enough wealth in the future to build another house. Brown, McKechnie, Hutchings, and even James Ashdown, all achieved substantial mobility during the 1870s. That said, it is important to qualify the actual extent of their mobility. To begin with, none of these men came from backgrounds of urban poverty; rather, they all came from relatively prosperous farming backgrounds, as well as all being apprenticed in a trade. Moreover, Hutchings and Ashdown had come from quasi-entrepreneurial families: as a child, Ashdown received a business education in his father’s country store, and later his father became a partner in his Winnipeg business, while Hutchings’ father had been involved in the lumber business. In addition, the career-patterns of Brown, McKechnie and Hutchings—the tradesman-turned-industrial capitalist—represented a degree of social mobility that, to a large extent, never reproduced itself among those members of the business elite who arrived in Winnipeg later on. The frontier conditions of the 1870s, then, appear to have resulted in a particularly fluid period of class formation in Winnipeg’s history. The problem is, of course, that popular myth has assumed that substantial upward mobility was the norm, rather than the exception. The evidence suggests otherwise. Based upon a survey of several biographical dictionaries , supplemented by other sources, the economic origins of thirty-two prominent Winnipeg businessmen of the 1870s have been compiled. Of this group, nine were apprenticed in a trade and/or came from a farming background. Whereas—using the occupation of the father and other family members, as well as educational levels as indices—twenty-three people from this group appear to have come from professional or business classes. Thus, even when Winnipeg was but a small frontier town, the business community was composed primarily of men who had come from relatively affluent families. William Alloway, for example, was born in Ireland in 1852 to a prominent Protestant family, whose roots could be traced back to the Battle of the Boyne. His father, who was a Captain in the British military, immigrated with his family to Canada in 1855; they settled in Hamilton initially, but two years later they moved to Montreal. In Canada, Alloway’s father became an officer with the Queen’s Own Rifles, as well as the owner of “some fine race horses”, which William Alloway and his brother, Charles, would ride in various fairs. And, young William received his education from the High School of Montreal, a department of McGill College. Charles Bell, though not of the same patrician upbringing as Alloway, was also born into a fairly well-to-do family; his father worked in the civil service in Perth, Ontario, where Bell attended a grammar school, receiving an education in the arts. Furthermore, even though most of Winnipeg’s emerging industrial elite came from relatively modest means, this did not hold true in all cases, as in the case of E. L. Drewry. Born in London, England in 1851, E. L. Drewry moved with his family to St. Paul, Minnesota at the age of six, where his father owned and operated a brewery. By the age of sixteen, Drewry had become involved in his father’s brewery, and at the age of twenty-three, in 1874, Drewry married Eliza Starkey, the daughter of a prominent St. Paul politician. Three years later, in 1877, Drewry moved to Winnipeg, taking over an idle brewery, which he operated as the Redwood Brewery. Drewry’s sixteen-year-old brother, George, also arrived in Winnipeg that year, helping in the operations of the brewery. In 1881, Drewry’s other brother, Fred, who had been educated in the business college in St. Paul, came to help in the management of the Redwood Brewery. 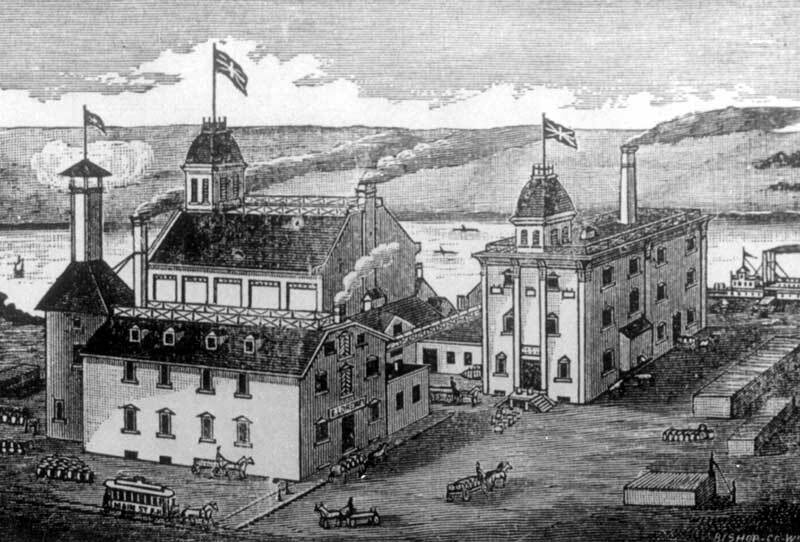 By the early 1880s, the brewery had been expanded substantially. George Drewry superintended the brewing operations, which had a capacity to produce “10,000 barrels of ale, porter, and beer per year”, while Fred Drewry overlooked the plant’s soda water works, which could produce fifty to seventy bottles of carbonated drink per day. It is reasonable to conclude that E. L. Drewry’s economic origins were noticeably different than tradesmen-turned-manufacturers like Alexander Brown and Elisha Hutchings. Drewry came from an affluent family, and his marriage to the daughter of Captain James Starkey, Speaker of the first Legislature of Minnesota, provides a testament to the established wealth and status of his family. The Redwood Brewery, then, represented a sort of informal extension of the Drewry family business. Unlike the tradesmen-turned-manufacturers—who accumulated much, if not all, of their capital locally—Drewry appears to have come to Winnipeg with capital in-hand, as he purchased the brewery the same year he arrived in the city. Later on, the social significance of old wealth as compared to new wealth will be discussed, but, at this point, the discussion will consider the transition within Winnipeg’s business community that began to occur by around 1880. Accumulating capital in Winnipeg: Drewry’s ale and lager beer brewery, Main Street, 1884. In 1879, barely over 4,000 people resided in Winnipeg; in 1880, 8,000 people resided in Winnipeg; and by 1881, more than 16,000 people lived in the city. A speculative boom in real estate had engulfed the city by early 1881; land prices soared and many speculators made a “killing.” However, in the spring of 1882, the boom collapsed, and the central Canadian and British financial institutions that had financed the boom responded by calling in their loans and tightening up lending policies. A large number of local businesses went bankrupt. Winnipeg, nonetheless, had emerged as a noteworthy commercial centre. John Galt, a son of A. T. Galt, came to Winnipeg with his cousin, George F. Galt, in 1882. Soon this pair commenced the wholesale grocery business of G. F. & J. Galt, which quickly established a considerable trade. The twenty-three-year-old Augustus Nanton, whose father had been in partnership with A. T. Galt, appeared in the city as well, arriving in 1883 to manage the western investments of the Aberdeen-based North of Scotland Canadian Mortgage Company. The arrival of scions of the moneyed central Canadian bourgeoisie in Winnipeg signalled the growing importance of non-local capital in Winnipeg’s economy. Differing from the tradesmen-turned-manufacturer—who emerged during the 1870s, having accumulated their capital locally—men like William Rae Allan and Frederick Brydges came to Winnipeg to expand upon—rather than to create—fortunes. Moreover, Allan and Brydges controlled an amount of capital which dwarfed the capital of locally-made businessmen: the 1891 Dun and Bradstreet credit report indicates that the firm of Allan, Brydges & Co held assets of $750,000 to $1,000,000—the next most valuable firm owned by a Winnipeg resident was James Ashdown’s wholesale concern, which had assets of $200,000 to $300,000. Thus, upon their arrival in the city in the early 1880s, and by virtue of the amount of capital they controlled, scions of the central Canadian bourgeoisie were important members of Winnipeg’s business elite. Local manufacturers prospered enormously. Elisha Hutchings incorporated the Great West Saddlery Company in 1900 with paid-up capital of $250,000, as well as expanding its retail outlets throughout the prairies. Hutchings built another manufacturing plant in Winnipeg in 1910, which, along with his other Winnipeg plant, was “equipped with the latest up-to-date electrical machinery as fine as can be found on the market.” Soon these plants were employing 300 workers. By 1911, the company’s capital had expanded to $2,000,000. E. L. Drewry along with his brother, Fred, expanded their brewing concern, establishing several branch plants in western Canada; their assets grew to over $1,000,000. New manufacturing concerns were established as well. Thomas R. Deacon and Hugh B. Lyall established the Manitoba Bridge and Iron Works Ltd in 1903. * Source: Dun and Bradstreet Credit Reports, 1891 and 1911. 1 Frederick Stobart no longer resided in Winnipeg in 1911. 2 Original proprietor of the firm, R. J. Whila, died in 1905. Banking in Winnipeg: The Union Bank building, corner Main & William, Winnipeg, c1910. Deacon viewed the completion of the waterworks, primarily, within the context of economic development. And, indeed, Deacon stood to increase his profit margins in the Manitoba Bridge and Iron Works, as the new water supply was less corrosive, thus giving the pipes and boilers in his factory a longer life. United by a common set of interests and concerns, the bourgeoisie was a powerful enclave that dominated civic politics, taking turns serving terms in council and the mayor’s office. The bourgeoisie’s privileged access to positions in municipal government is suggested in the following correspondence, from Sanford Evans to his wife: “Bill Alloway asked me the other day if I would run for mayor [and] I told him that I didn’t know. Today he said it would be a go if I say so. I think that is the way things are shaping up.”  A month later, Evans was informed—by Richard D. Waugh, who would also become mayor later on—that he was the Manitoba Free Press choice for mayor. He was elected mayor in 1909. This quote reflects the elite’s assumption that political power naturally belonged in their own hands; Hutchings believed that the city was indebted to him by virtue of his “services” and that he had therefore been betrayed when he was not elected mayor. In attempting to understand why Hutchings did not succeed in becoming mayor, the social differences between himself and the majority of the bourgeoisie provide a possible explanation. As a tradesman-turned-manufacturer, Hutchings was not well-versed in bourgeois social and cultural mores, nor did he have familial connections to the rest of the bourgeoisie, and this may have lessened his social standing in bourgeois social circles, which, given the bourgeoisie’s dominance in municipal politics, may have been politically damaging. Also, Hutchings never became a member of the Manitoba Club, which was a veritable who’s who of Winnipeg’s bourgeoisie. Hutchings, similarly, did not live in the stylish residential area of the business class, but instead, he lived in the quasi-working-class Point Douglas area. Speculatively, then, we might conclude that political power amongst the city’s bourgeoisie did not necessarily correlate with the amount of wealth that one controlled—recall, Hutchings’ Great West Saddlery Company was conducting business throughout western Canada at the time he vied for the mayoralty—but it also depended upon one’s integration and acceptance into bourgeois society circles. That said, it is important to note that numerous members of the elite invested in real estate on behalf of central Canadian, British and US interests. The personal papers of Sanford Evans, for example, suggest that his real estate transactions were primarily done on behalf of foreign financial companies. In 1908, Evans received an offer from the C. S. Dudley Company of Minneapolis—a financial firm—asking him if he would sell for them a tract of Saskatchewan farmland, for which he was offered a commission of $1.50 per acre; and in 1910, Evans sent a circular to a London, England-based trust company, promising a seven to ten percent return on investment in western realty. Evans, of course, also held important familial ties to the central Canadian bourgeoisie, and so while he may have controlled locally and regionally invested capital, as well as being the mayor of Winnipeg from 1909 to 1911, he was nationally and internationally oriented in terms of his business and familial relationships. The wealth and power of the bourgeoisie played an important role in shaping distinct, bourgeois social and cultural activities and lifestyles. The residential pattern of Winnipeg’s bourgeoisie illustrates the growing cohesiveness of a class that was increasingly seeing itself as distinct from the rest of society. Scions from the moneyed central Canadian bourgeoisie, along with others who came from affluent backgrounds, came to Winnipeg with established bourgeois social and cultural mores, and it is therefore not surprising that they were the first to migrate outside of the hustle and bustle of the city. The patrician William Alloway—having just married Elizabeth McLaren, daughter of James McLaren, Ottawa Valley lumber baron and president of the Bank of Ottawa—built a mansion on Armstrong’s Point in the late 1870s, which, at the time, was a rather secluded area. Despite the relative seclusion of the Alloway residence, it nonetheless “became the early social centre of Winnipeg.”  The young scions of the central Canadian bourgeoisie, who arrived in the city in the early 1880s, also sought out secluded residential areas. Augustus Nanton, William Rae Allan, and future president of Great-West Life, George W. Allan, among others, resided in a bachelor pad—known as “The Shanty”—that was partitioned from the rest of the city by the Red River; this bachelor pad was located on what would become Roslyn Road, which emerged in the twentieth century as one of Winnipeg’s most affluent streets. “The Shanty,” as well, became a centre of social life in Winnipeg, as it was later described as “the greatest centre of social activity in the old days.”  These were some of the foundations of what would later be referred to, collectively, as the South End. As divisions of class became more pronounced in the city, men like Ashdown and Hutchings moved into the city’s South End as well. Before the turn of the century, Ashdown moved into a house on Winnipeg’s showcase street, Broadway, and later he moved to one of Winnipeg’s most affluent streets, Wellington Crescent, in the upper-class residential development of Crescentwood. In 1906, Hutchings came to Crescentwood as well, leaving behind his fairly modest Point Douglas home to move into an opulent mansion across the street from Ashdown. It was as though he had walked into a picture in one of his childhood books, past the painted margin to a land that lay smiling under a friendly spell, where the sun always shone, and the clean-washed tint of the sky and child and garden would never fade; where one could walk, but on tip-toe, and look and look but never touch, and never speak to break the enchanted hush. It grew real. There was the faint murmur of the city far in the background and overhead the whisper of the wind in the trees. The green here was not as he had ever seen it on leaf or weed, but with the blue of the sky in it, and the air so clear that even the sky looked different here. By the early twentieth century, the bourgeoisie lived almost exclusively in these upper-class developments or, in some cases, in the well-to-do residential area adjacent to the north, around Broadway. Located almost exclusively in the city’s South End, the bourgeoisie maintained lifestyles where visible signs of wealth were commonplace. Indeed, having wealth and using that wealth to live a patrician lifestyle was a badge of status. By the late nineteenth century, for instance, Town Topics—a paper, beginning publication in 1898, that was devoted to High Society—had begun to publish photos of Winnipeg’s “pretty homes,” where the mansions of the elite were put on display. 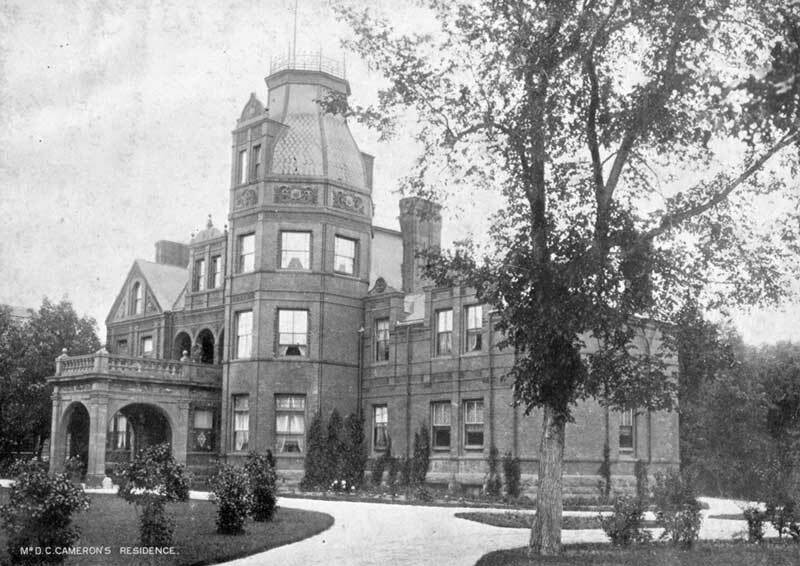 Augustus Nanton’s mansion, “Kilmorie,” on Roslyn Road was among the largest in the Winnipeg. Built on a five-acre lot in 1900, the mansion included four rooms for the maids alone, two bowling alleys, a music room, and a billiard room—just to name a few; at one gathering at Kilmorie 180 people attended. Years later, Charles Bell’s daughter reminisced about what it was like as a child growing up in the South End in turn-of-the-century Winnipeg : she had happy recollections of Harry Ashdown—at that time a young man, and heir to the J. H. Ashdown Hardware Company—taking her for rides in the car and teaching her the alphabet, as well as memories of going on carriage rides with the lieutenant governor’s wife—Lady Schultz—who would always stop to buy a banana split along the way. A cohesive urban establishment had been formed. Displaying wealth: The home of Douglas C. Cameron, 65 Roslyn Road, Winnipeg, c1910. Table 2. Residential Areas of Winnipeg's Elite. 1	All of those who lived north of Portage came from relatively modest backgrounds, with the exception of E. L. Drewry, Armine Frederick Banfield and George Carruthers. E. L. Drewry lived next to his brewery in the North End. Armine Frederick Banfield, who was born to a leading merchant family in Quebec City, lived in the downtown; by 1900, however, he had moved to the area around Broadway Street. George Carruthers, who had been in partnership with J. H. Brock in the insurance business during the 1880s, lived in the North End on the banks of the Red River, secluded from the urban poverty that characterized much of that area. 2	Most of the people who lived in this area came from privileged economic origins. Armstong's Point was a particularly high status residential area within this area. Those who lived in Armstrong's Point included Frederick Brydges; J. A. M. Aikins, lieutenant governor of Manitoba in the late 1920s; John Galt; R. T. Riley; William Alloway; Frederick Stobart; Hugh Sutherland, railway contractor, Dominion Superintendent of Public Works from 1874 to 1878, Member of Parliament for Selkirk in 1882, and an organizer of the Hudson's Bay Railway Company; as well as the sons of Charles Tupper, James Stewart Tupper and William Tupper. 3	In 1890, few members of the elite lived south of the Red River; but those who did live there came from very well-to-do central Canadian families - e.g., William Rae Allan and Augustus Nanton. And as the figures demonstrate, over the next thirty years most of the bourgeoisie migrated to this part of the city. Charles Bell was also involved with the Canadian Club, being elected president in 1912. Bell had long been involved in intellectual endeavours. In 1879, he helped to found the Manitoba Historical and Scientific Society, which was heavily patronized by Winnipeg’s business and professional classes. In 1885, he was made a fellow of the Royal Geographic Society, being “acknowledged as one of the greatest living authorities on the history and archaeology of Manitoba and the mid-west”; he later received an honorary degree from the University of Manitoba. Bell also had an impressive collection of early maps, “Indian artifacts,” and old diaries and letters, which interested many of the guests that visited his large house on Carlton Street. Bell, as well, published two local histories—The Selkirk Settlement and Settlers in 1887 and The Old Forts of Winnipeg in 1927. Women also played a role in bourgeois intellectual and cultural life. Irene Evans, wife of Sanford Evans, became the first president of the Woman’s Canadian Club of Winnipeg in 1907—the female equivalent of the men’s Canadian Club. The Women’s Social Science Study of Winnipeg also attracted a number of women from the elite, where they would research and discuss the pressing social concerns of the day, such as industrial relations and the character of non-British ethnic groups. The Women’s Musical Club of Winnipeg was distinctly bourgeois as well. By examining those women who filled leadership positions in the club, the connection between taste in music and privileged economic origins becomes apparent. In brief, those who had come from old wealth tended to play particularly important roles in the functioning of the club. Irene Evans served as president of the club from 1903 to 1906. As part of being the daughter of a prominent Toronto industrialist, she received a patrician upbringing as a child, allowing her to become a gifted pianist, as well as the founder of the Woman’s Musical Club of Toronto in 1889. In Winnipeg she became a central member in the city’s cultural elite. One contemporary explained, “She presides with gracious hospitality over an attractive home which is the center of a cultured society circle.”  Her leadership in this circle was evidenced when she wrote to her husband in March 1915: “I have a bunch coming here tomorrow for tea and music so [I] spent this morning baking cake and cookies—its good to be at the helm again.”  Likewise, George F. Galt’s wife served a term as president as well, from 1900 to 1901, and she was the daughter of the prominent surgeon Sir William Hingston. Edith Rogers, wife of Robert A. Rogers, owner of Crescent Creamery and notable Liberal, sat on the club’s board of directors; she was the daughter of local financier W. J. Christie and the great-granddaughter of Sir George Simpson—and so on. Bourgeois social life: Garden party at the home of Hon. Robert Rogers, 197 Roslyn Road, Winnipeg, c1920. On the other hand, the wives of tradesmen-turned-manufacturers like Alexander Brown, John McKechnie and Elisha Hutchings were conspicuously absent from the membership of the Women’s Musical Club. Although a more comprehensive and systematic analysis would be needed for a definitive answer, those who came from wealthy economic origins seem to have been able to attain a higher social standing than those who came from modest means. Indeed, the membership roles of the most important social clubs—the Manitoba Club and the St. Charles Country Club—tends to support this conclusion, as the tradesmen-turned-manufacturers appear to have been excluded from those clubs. However, at this point it is not possible to determine whether or not they applied for membership. So, it is possible that they were not excluded, but rather, simply did not apply; in which case, it is likely that they chose not to apply because they did not feel comfortable in upper-class society. Though, it does seem somewhat unlikely that, given the social importance of the Manitoba Club, men like Hutchings would have stayed aloof from the club had the door been open to them. The numerous teas, dinners, and other informal social gatherings that characterized Winnipeg High Society helped to consolidate the dense social networks that interlinked members of the elite. And in such social situations, the role of hostess was of considerable social importance. One such social gathering was the garden party of Mrs. Mabel Galt—wife of John Galt—at her Fort Rouge home, in 1898. Described as “the prettiest garden party ever given in Winnipeg,” it attracted some of Winnipeg’s most prominent families. Brydges, Alloway, Allan, Stobart and Nanton were but a few of the prominent Winnipeg families who were represented at the party. The general impression that one gets from this party, as well as the numerous other social gatherings that received coverage in Town Topics, tends to suggest, yet again, that those from old wealth were at the forefront of cultured society circles. Indeed, Table 3 illustrates the dense familial and business connections that interlinked those from old money—essentially those who had come from the central Canadian bourgeoisie. 1	W. Sanford Evans was the nephew of W. E. Sanford’s wife. He moved to Winnipeg in 1902. 2	J. A. M. Aikins was a director in William Alloway’s bank - Alloway & Champion. 3	R. T. Riley came to Winnipeg in the early 1880s to look after the western investments of W. E. Sanford. 4	J. W. Hamilton was connected to William Rae Allan and John Galt through his position as general manager of the Union Bank - he was appointed to that position in 1923. 5	R. D. Baker was born in Winnipeg in 1895, and became the general manager of James A. Richardson & Sons, stockbrokers and bond dealers. 6	G. W. Allan acted as the lawyer for Osler, Hammond & Nanton in Winnipeg. *	Those on the top row of the graph - other than C. J. Brydges - never lived in Winnipeg. Apart from Conrad Black, the rest of those in the graph did live in Winnipeg; however, a number of them left the city later in their careers - e.g., George Montegu Black Jr., Gordon P. Osler, Augustus Nanton, and Douglas Lorn Cameron. It is important that we do not mistake these acts of giving as simple charity. As historian Mariana Valverde has shown, philanthropy was not merely indiscriminate giving, but rather an attempt to “reform” the lower classes. For example, the Women’s Musical Club of Winnipeg joined forces with a number of local charities through the winter of 1913-14 to put on a series of musical performances in the North End. In promoting these concerts, some “3000 handbills, announcing the concerts in four different languages, English, German, Ruthenian, and Polish were distributed in the North End with the assistance of the Associated Charities, The Margaret Scott Mission, Day Nursery, Free Kindergarten and the Deaconess Home.”  These performances were, then, very clearly intended to “refine” the working class, and particularly those who were not British. The Free Press lauded these performances as a “new conception of social service”, which provided those “less fortunate fellow-citizens” with access to music, “with its spiritual influence and refining qualities.”  For the bourgeoisie, philanthropy was a means to socialize the lower classes, teaching them responsibility and discipline—in short, preparing them to become hard workers on the job and loyal citizens at home. The bourgeoisie’s involvement in philanthropic work was fundamentally rooted in their paternalistic attitude towards the lower classes. Workers who sought to unionize were regarded as troublemakers. Industrialists, like Elisha Hutchings and Thomas R. Deacon, refused to recognize labour unions. In 1911, Hutchings dismissed ten of his employees when they refused to sign a document forbidding them from unionizing. Eight years later, while 30,000 workers participated in the 1919 Winnipeg General Strike, Deacon explained to the Royal Commission on Industrial Relations that he always ran “an open shop.”  Being an industrious, upstanding worker—to the eyes of the business elite—also meant not challenging their power. Workers were also finding it harder to join the ranks of the business elite. Differing from the tradesmen-turned-manufacturers of the 1870s, Thomas R. Deacon arrived in Winnipeg in 1902, having worked as a consulting engineer for the Mikado Mining Company in Rat Portage, where he made an annual salary of about $47,000. Entrepreneurship, increasingly, was something only for the business and professional classes. In her testimony before the Royal Commission on Industrial Relations, Mrs. R. F. McWilliams, wife of a prominent local barrister, was asked if she thought that “the thrifty worker becomes the capitalist of the future”. She responded, “He does at times; he is not becoming it in this particular instance.”  And, as Table 4 shows, people of working-class backgrounds were virtually absent from the elite in the late twenties and late thirties. *	Figures compiled from the Who's Who in Canada, 1927; Who's Who in Canada 1936-37 and Who's Who in Canada 1938-39. By the time of the 1919 Winnipeg General Strike, Winnipeg had already entered a period of relative economic decline from which it would never regain its former position. Ruben Bellan and Allan Levine have both suggested that the seeds of Winnipeg’s relative economic decline lay fundamentally in the opening of the Panama Canal in 1914, which had the effect of diverting trade—that once ran through Winnipeg—over to Vancouver. Artibise, on the other, has suggested that Winnipeg’s relative economic decline was brought about by a faceless hoard of branch plant managers who were arriving in the city in increasing numbers through the twenties and thirties. Both lines of interpretation assume that Winnipeg’s economic decline was essentially brought on by factors outside of the city. However, an analysis of how Winnipeg’s business elite reacted to the relative economic decline of their city may help us to reconsider this assumption. By the late 1920s, Manitoba Bridge shifted its production towards collateral lines of construction material; in this way, the firm could avoid competing against Dominion Bridge’s branch plant in Winnipeg, which only produced bridge and structural steel. Meanwhile, the greatest merger movement in Canadian history, from 1925 to 1930, was in the process of taking place. As the board of directors of Manitoba Bridge celebrated the company’s twenty-fifth anniversary in 1928, the growing concentration and consolidation in the national economy was to soon impact the company’s future. In January 1930, Deacon wrote to the shareholders of the company, recommending a merger between Manitoba Bridge and Dominion Bridge; the deal was accepted and Deacon was appointed to Dominion Bridge’s board of directors in Montreal. With the absorption of Manitoba Bridge, control of the firm came into the hands of the Montreal board of directors. A similar process can be seen with Elisha Hutchings’ Great West Saddlery Company. As early as 1919, the Great West Saddlery Company had begun to produce automobile accessories. In 1928, however, Hutchings put to rest any ideas of expanding his plant, as he appears to have sold off his interests in the firm to the Toronto General Trusts Corporation. Indicative of the new ownership, Toronto capitalist Fred Curry was appointed managing director of the firm the following year. Although the lack of company papers makes the analysis here somewhat speculative, it is significant to note that Great West Saddlery never did make the transition to the manufacture of automobile accessories; as the saddlery business faded, so did the company, which, for all intents and purposes, was gone by the 1960s. This tends to indicate that the new management—Fred Curry—did not set out to build a competitive business, but had other intentions—restricting competition with central Canadian industries, for example. The business interests of Elisha Hutchings had undergone a significant transformation as well. After Hutchings sold Great West Saddlery he continued to play an active role in finance capitalism: when he died in Winnipeg in 1930, he was the president of the Equitable Trust Company and the Canada Loan and Mortgage Corporation. Winnipeg’s business elite actively sought to merge their concerns with large central Canadian firms as a strategy to maintain and perpetuate their own wealth. This, in turn, shifted the control of Winnipeg-based companies to corporate directorates in Toronto and Montreal. This process took place in the financial sector as well. William Alloway’s banking house of Alloway & Champion had grown with Winnipeg through the boom period, but by 1916 Alloway had begun to look to merge his bank with a chartered bank. In 1919 he succeeded, merging his bank with the Canadian Bank of Commerce. Although under the control of the Canadian Bank of Commerce, Alloway & Champion continued to maintain offices in Winnipeg. In 1930, however, six months after Alloway’s death, Alloway & Champion’s Winnipeg head office was shut down and moved to Toronto, while its branch offices in the city were amalgamated with those of the Canadian Bank of Commerce. The Union Bank followed a similar pattern. 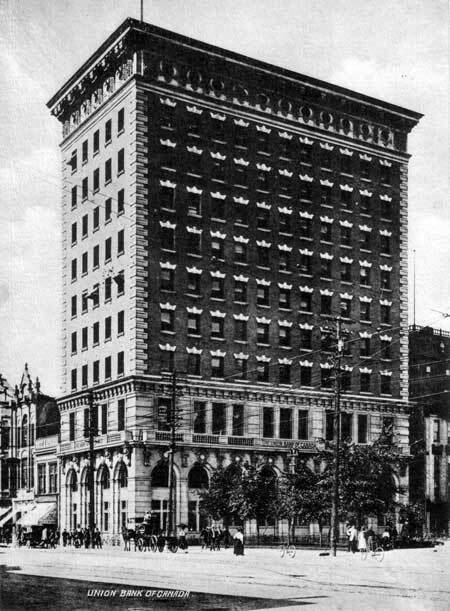 After having succeeded in bringing the headquarters of the Union Bank to Winnipeg in 1912, Winnipeg’s business elite proceeded to play a dominant role in managing the bank’s affairs. John Galt and William Rae Allan both served terms as president, while others—including R. T. Riley, E. L. Drewry, and Manlius Bull—sat on the board of directors. By the 1920s, however, the bank’s future in Winnipeg had become tenuous. With the growing consolidation of Canada’s banking business through the late nineteenth and early twentieth century, it became harder and harder for smaller banks to survive on their own. In 1924, questions arose as to the Union Bank’s solvency, and at a shareholders meeting the following year, the bank’s president, William Rae Allan, argued in favor of an amalgamation with the Royal Bank of Canada—the shareholders approved the proposal unanimously. The legacy of the Union Bank merger persists for Winnipeggers today; the bank’s once well-kept, bustling headquarters beside City Hall now stands as a dilapidated, empty building. The examples of Osler, Nanton, along with others, including the Blacks, reflect the concentration of capital in central Canada. Moreover, the dense familial, social and business relations that interlinked these families, as well as other families that originated from central Canadian wealth, suggests that this group should be seen as a distinct enclave in Winnipeg’s bourgeoisie. Differing from those industrial capitalists who had risen from modest means in the 1870s, the scions of the central Canadian bourgeoisie came to Winnipeg with established social networks, and, as Table 3 would suggest, they appear to have reproduced themselves as a distinct enclave, with strong ties to central Canadian capital. The fundamental dynamics that obtained between Winnipeg and its early business elite need to be re-conceptualized. The standard interpretation has assumed that Winnipeg’s early elite had accumulated its capital in the West generally, and in Winnipeg specifically, and had thus acquired interests that were different than central Canadian capitalists. But, as this article has argued, Winnipeg’s elite was already tied through familial and business relationships to central Canadian capital—in a very real sense, Winnipeg’s elite simply represented an extension of the central Canadian elite. That said, we should be sceptical of how Alan Artibise applied the concept of boosterism to the elite in Winnipeg. Artibise assumed that central Canadian and American companies brought on Winnipeg’s economic marginalization; had only the western Canadian business elite recognized their collective, marginal position within the Canadian economy, Artibise argued, they might have been able to form a united front against central Canadian business. As it applies to Winnipeg, this analysis seems to ask the impossible, since Winnipeg’s elite was already highly integrated with central Canadian capital. Analytically, Artibise relied too much upon regional differentiation, failing to take into account the extent to which Winnipeg’s elite was integrated into a national business class. In addition, mergers with central Canadian firms were used by Winnipeg’s bourgeoisie as a strategy to safeguard wealth. Rather than compete with central Canadian and foreign companies, men like E. L. Drewry, Elisha Hutchings, and Thomas R. Deacon sold off their fixed investments in Winnipeg—the firms of all three men eventually came under the control of central Canadian interests. To some extent, the development of Winnipeg’s bourgeoisie from the 1870s to the 1930s is the story of a business class that, increasingly, was becoming economically detached from the city in which they lived. Whereas E. L. Drewry was the proprietor of a local brewery, constituting a substantial fixed investment in the community, his son Charles Drewry was more interested in financial companies, a much more transient investment that does not foster what Alan Artibise has called boosterism. The elite was also becoming socially and culturally detached from the city; although, in this respect they had always been somewhat detached from the city, because, to a large extent, Winnipeg’s bourgeoisie did not emerge in Winnipeg, but rather, was transplanted there. The residential pattern of the elite exemplified the elite’s conscious sense of distinction from the rest of society, and this consciousness simply heightened as lines of class became increasingly accentuated. The elite’s shared leisure activities, and social and cultural clubs further solidified this sense of distinction, as well as the elite’s growing cohesiveness. This cohesiveness spilt into the political realm as well. In municipal politics, the elite was dominant, and went about creating a conducive atmosphere for free enterprise, while, at the same time, neglecting basic public health issues and refusing to recognize labour unions. Indeed, Winnipeg’s elite maintained a very paternalistic attitude towards the lower classes, which was evidenced in their involvement in philanthropy. Through involvement in philanthropy the bourgeoisie sought to mould reliable, submissive citizens and workers, who would not challenge their vast amounts of political power. In sum, Winnipeg’s business elite constituted a cohesive urban establishment, whose business and familial connections spanned to central Canadian and even British elites. Based upon the findings of this article, the notion that Winnipeg’s elite accumulated their capital in the city and deeply identified with its interests needs to be questioned. Despite the strident pronouncements about the modest origins of Winnipeg’s elite, in reality much of the elite came to the city affluent, where they lived distinctly patrician lifestyles, tucked away in the city’s South End. The way in which the elite viewed themselves and the realities surrounding them was, above all else, a function of their class. Lines of class superseded regional differences. 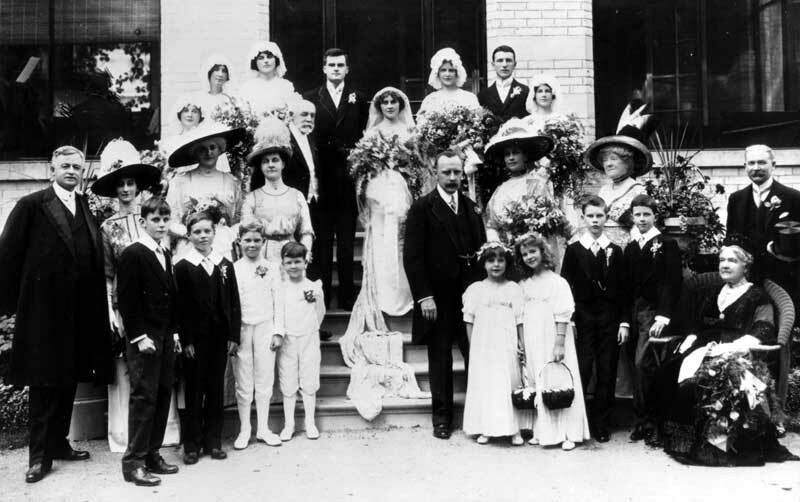 Inter-marriage within the business elite: The wedding of Douglas Lorn Cameron and Mary Georgina Nanton, 5 September 1912. Front row (L-R): Sir D. C. Cameron, Harry Small, John Chaffie, Paul Nanton, Gus Nanton, ?, Sheila Kirby, ?, Herbert Clark, Edward Nanton, Mrs. Clark, Dave Clark. Second row: ?, Dorothy Clark, Lady Cameron, Aunt Rose, A. M. Nanton, Ellie Nanton, Aunt Kate Hespeler. Third row: ?, Wm. Hespeler, Lorne & Georgina Cameron. Back row: ?, ?, Constance Nanton, George, Marguerite Nanton. 1. J. M. S. Careless, “The Development of the Winnipeg Business Community, 1870-1890,” Transactions of the Royal Society of Canada, series IV, no. 8 (1970), 254. 2. See Alan F. J. Artibise, Winnipeg: A Social History of Urban Growth, 1874-1914 (Montreal: McGill-Queens University Press, 1975); Artibise, “An Urban Economy: Patterns of Economic Change in Winnipeg, 1873-1971,” Prairie Forum 47 (1973), 189-217; Artibise, “Continuity and Change: Elites and Prairie Urban Development, 1914-1950,” in The Usable Urban Past: Planning and Politics in the Modern Canadian City, eds. Alan Artibise and Gilbert A. Stelter (Toronto: MacMillan of Canada), 130-154; and Artibise, “Boosterism and the Development of Prairie Cities, 1873-1913,” Town and City: Aspects of Western Development, ed. Alan Artibise (Regina: University of Regina Press, 1981), 209-235. 3. See David Bercuson, Confrontation at Winnipeg: Labour, Industrial Relations and the General Strike, rev. ed. (Montreal: McGill-Queen’s University Press, 1990), 51-2. 4. J. M. Bumsted, The Winnipeg General Strike of 1919: An Illustrated History (Winnipeg: Watson Dwyer, 1994), 6-8. 5. See Robert A. J. McDonald, “‘Vancouver’s Four Hundred’: The Quest for Wealth and Status in Canada’s Urban West, 1886-1914,” Journal of Canadian Studies 25, no. 3 (1990), 55-73; McDonald, Making Vancouver: Class, Status, and Social Boundaries, 1863-1913 (Vancouver: UBC Press, 1996), 149-174. 6. Throughout this paper the term bourgeoisie, business class, business elite, economic elite, or elite will be used synonymously to refer to the group under examination: these men were Winnipeg’s wealthy financiers, merchants, industrialists and grain dealers. 7. “Between 1900 and 1930 there were over 500 mergers in Canada, absorbing almost 1200 firms.” See Graham D. Taylor and Peter A. Baskerville, A Concise History of Business in Canada (Toronto: Oxford University Press, 1994), 311. 8. Donald Kerr, “The Wholesale Trade on the Canadian Plains in the Nineteenth Century: Winnipeg and its Competition,” in The Settlement of the West, ed. Howard Penner (Publishers: University of Calgary and Comprint Publishing Company, 1977), 130-31 and 133. Alexander Begg came to the Red River Settlement representing W. E. Sanford’s Hamilton-based ready-made-cloth manufacturing firm. Sanford is credited as being “the first Canadian clothing manufacturer to capture the Red River trade,” and, in later years, Sanford became heavily interested in western real estate and land development. See Peter Hanlon, “William Eli Sanford,” Dictionary of Canadian Biography, ed. Frances G. Halpenny (Toronto: University of Toronto Press, 1990), 939. 9. J. E. Steen and W. Boyce, Winnipeg, Manitoba, and Her Industries (Winnipeg: Steen & Boyce, 1882), 10-11 and 49; W. T. Thompson and E. E. Boyer, The City of Winnipeg—The Capital of Manitoba and the Commercial Railway and Financial Metropolis of the Northwest: Past Present and Future Prospects (Winnipeg: Thompson & Boyer, 1886) in Gateway City: Documents on the City of Winnipeg 1873-1914, ed. Alan Artibise (Winnipeg: The Manitoba Record Society, 1979), 50. 10. Steen and Boyce, 11. 11. Gerald Friesen, The Canadian Prairies: A History (Toronto: University of Toronto, 1987), 162. 12. Peter Lowe, “All Western Dollars,” Manitoba Historical Society Transactions, series III, no. 2 (1946), 12. 13. Legislative Library (hereafter LL), Manitoba History Scrapbook 5, 57: 26 June 1911. 14. Artibise, Winnipeg: A Social History of Urban Growth, 1874-1914, 130. 15. Alloway acquired this piece of land through a transaction with James Mulligan, who lived on Armstrong’s Point. Mulligan commissioned Alloway to acquire for him a team of horses and a carriage. Alloway did this on one of his many trips to central Canada, spending $1,400, and for this, Mulligan gave Alloway a strip of Armstrong’s Point land that extended north to Portage Avenue. Alloway later sold this land for $30,000. See Lowe, 13. 16. Lowe, 15 and 17. 17. Alexander Begg and Walter R. Nursey, Ten Years in Winnipeg (Winnipeg: Times Publishing House, 1879), 83. 18. Steen and Boyce, 49. 19. Thompson and Boyer, 52 and 56. 20. Provincial Archives of Manitoba (hereafter PAM), Alexander Brown Papers, MG8 B92, Box 1, File 1, Margaret Brown to Alexander Brown, 24 April 1872. 21. Ibid, Alexander Brown to Margaret Brown, 18 July 1872. 22. Ibid, Alexander Brown to Margaret Brown, 26 August 1872. 23. Ibid, Alexander Brown to Margaret Brown, 21 July 1872. 24. Ibid, File 7, Alexander Galt to Margaret Brown, 24 September 1873. 25. Steen and Boyce, 47. 27. F. H. Schofield, The Story of Manitoba, vol. II (Winnipeg: The S. J. Clarke Publishing Company 1913), 28. 28. Steen and Boyce, 57-8. 29. LL, Biography Scrapbook 8, 220, Winnipeg Tribune, 14 April 1930. 30. Schofield, The Story of Manitoba, vol. II, 124. 31. Steen and Boyce, 46. 32. The biographical dictionaries used were primarily the Who’s Who in Western Canada, 1911 (Vancouver: Canadian Press Association Ltd, 1911) and William Cochrane, ed., The Canadian Album, vol. III (Brantford: Bradley, Garretson & Co, 1894). To a lesser extent F. H. Schofield, The Story of Manitoba, vols. II and III (Winnipeg: The S. J. Clarke Publishing Company, 1913) and George MacLean Rose, ed., A Cyclopedia of Canadian Biography; Being Chiefly Men of the Time (Toronto: Rose Publishing Company, 1888) were also used, as well as other sources. 34. Cochrane, 234; J. H. Brock—who arrived in Winnipeg in 1879, becoming a partner in George F. Carruthers’ insurance agency, and who would spearhead the formation of The Great-West Life Assurance Company in 1891—also attended the High School of Montreal, and it is not unlikely that Alloway and Brock attended together, as they were only separated in age by two years. See Richard E. Bennett, “Jeffry Hall Brock,” Dictionary of Canadian Biography, 1911-1920, vol. 14 (Toronto: University of Toronto, 1998), 146-47. 35. Steen and Boyce, 50. 37. Ruben C. Bellan, Winnipeg First Century: An Economic History (Winnipeg: Queenston Publishing Co, 1978), 29. A significant portion of the over 16,000 people who resided in Winnipeg in 1882, no doubt, constituted a floating population, as the federal census of that year set Winnipeg’s population at 7,985. See Artibise, Winnipeg: A Social History of Urban Growth, 1874-1914, 130. 38. In 1883, 101 Winnipeg businesses went bankrupt, with cumulative liabilities of $1,750,000. See Bellan, 35. 39. Other investors in the company included the Winnipeg notables, Daniel H. McMillan and J. A. M. Aikins. See Memoirs: R. T. Riley, n.d., 62. 40. Memoirs: R. T. Riley, 67-69; Hanlon, 941. 41. A. A. den Otter, Civilizing the West: The Galts and the Development of Western Canada (Edmonton: University of Alberta Press, 1982), 83. 45. R. G. MacBeth, Sir Augustus Nanton: A Biography (Toronto: MacMillan of Canada, 1931), 12-13. 46. The early stage of a work career appears to have been viewed by the bourgeoisie as a time of “character building.” As a result, in some cases young, bourgeois men would do work that did not reflect their bourgeois status. R. T. Riley, for example, got his son Sanford to work as an apprentice machinist in the Northern Pacific Railway shops, where he received 5 cents per hour. See C. S. Riley, n.d., 10. 48. LL, Sheila C. Grover, “113 Market Avenue: The Great West Saddlery Building,” (Winnipeg: Historical Buildings Committee, 1985), 1; B. M. Greene, ed., Who’s Who in Canada, 1929 (Toronto: International Press Ltd, 1929), 1522; Paul Voisey, “In Search of Wealth and Status: An Economic and Social Study of Entrepreneurs in Early Calgary,” in Frontier Calgary: Town, City and Region, 1875-1914, eds. Anthony W. Rasporich and Henry Klassen (Calgary: University of Calgary, 1975), 225. 50. Allan Levine, “Nicholas Bawlf,” Dictionary of Canadian Biography, 1911-1920, vol. 14, (Toronto: University of Toronto, 1998), 39. 51. See Allan Levine, The Exchange: 100 Years of Trading Grain in Winnipeg (Winnipeg: Peguis Publishers Ltd, 1987), 36-38. 52. PAM, Winnipeg Board of Trade Papers, MG 10 A2, Box 1, Winnipeg Board of Trade, 10th Annual Report, 1889, 13. 54. PAM, Winnipeg Board of Trade Papers, Fifteenth Annual Report of the Winnipeg Board of Trade, 1894, 9. 55. Ibid, Twenty-First Annual Report of the Winnipeg Board of Trade, 1900, 15. 56. Artibise, Winnipeg: A Social History of Urban Growth, 1874-1914, 132. 57. Schofield, The Story of Manitoba, vol. II, 124. 58. Schofield, The Story of Manitoba, vol. III, 706. 61. Schofield, The Story of Manitoba, vol. II, 722. 62. LL, Biographical Scrapbook 9, Free Press, 10 April 1933. 63. R. T. Riley: Memoirs, 86-87. 64. See J. M. Bumsted, Dictionary of Manitoba Biography (Winnipeg: the University of Manitoba, 1999), 185 and PAM, Augustus Nanton Papers. 66. Michael Bliss, A Canadian Millionaire: The Life and Business Times of Sir Joseph Flavelle, Bart., 1858-1939 (Toronto: MacMillan of Canada, 1978), 219. 67. Alloway & Champion’s considerable involvement in this line of business is illustrated by the following account, given by Peter Lowe, a former teller and executive of Alloway & Champion: “By the year 1904 the volume of foreign business done by Alloway & Champion reached such proportions that a decision was made to erect a branch office near the Canadian Pacific Railway depot, largely for the purpose of giving banking service to foreign immigrants and residents. The branch was opened at 667 Main Street in 1905, and was successful from the beginning. My career with Alloway & Champion began in this branch in October, 1906, and the staff then consisted of five linguists a stenographer who was called on to operate not only an ordinary typewriter, but a Russian language typewriter as well. The remaining staff was made up of an English manager, myself as teller, and an office boy, all of whom acquired sufficient knowledge of the language spoken by those of Slavic descent, to do the business of his department or to direct the customer to the linguist in charge of serving his particular need.” See Lowe, 22. 68. Lowe, 20-23. When Alloway & Champion was incorporated, William Alloway became president, H. T. Champion became vice president, and Charles Alloway became a director. As well, five others were added to the board of directors. These people were: Colin H. Campbell, George F. Galt, F. W. Heubach, Daniel McMillan, and D. E. Sprague. 69. R. T Riley: Memoirs, 85. 70. As a result of the merger, all but two of the sawmills in Rat Portage were closed. See Deborah Anne Welch, “T. A. Burrows, 1857-1929: Case Study of a Manitoba Businessman and Politician,” (unpublished M.A. thesis, University of Manitoba, 1983), 109. 71. LL, Biographical Vertical File, “Douglas Colin Cameron,” The Canadian Press, 19 June 1917. 72 B. M. Greene, ed., Who’s Who in Canada, 1927 (Toronto: The Mussan Book Company Ltd, 1927), 244. 73. Artibise, Winnipeg: A Social History of Urban Growth, 1874-1914, 30. 74. Manitoba Free Press, 1 January 1914, 9. 76. Royal Commission on Industrial Relations, Evidence, Winnipeg, 12 May 1919, 1527. 77. See Artibise, Winnipeg: A Social History of Urban Growth, 1874-1914, 37-42. 80. Artibise, Winnipeg: A Social History of Urban Growth, 1874-1914, 43. 81. PAM, Winnipeg Board of Trade Papers, 33rd Annual Report of the Winnipeg Board of Trade, 1912, 25-26; See Artibise, Winnipeg: A Social History of Urban Growth, 1874-1914, 233-245. 82. PAM, Thomas Russ Deacon Papers, MG 14 B1, File: “Speeches, Letters to editors, articles, etc.”, Winnipeg Saturday Post, 7 December 1913, 1. 83. Ibid, T. R. Deacon, “Address on the Development of Winnipeg,” 9 October 1913, 5. 84. A pamphlet published by the Winnipeg Board of Trade in 1919, listed the following benefits that would be attained when the waterworks were completed (the new water flowed into Winnipeg that year): “WITH THE ADVENT OF SHOAL LAKE WATER : Less soap will be required and washing powders for softening purposes unnecessary. CISTERNS WILL BE DISPENSED WITH representing a saving to citizens of $58,000 CHEMICAL SOFTENING PLANTS WILL BE DISPENSED WITH and a saving of $1,161,000 will be made annually. Corrosion in old pipes will be removed and new pipes will kept clean. This will save $27,600 Winnipeg citizens $115,000 yearly. $27,600 will be saved on the maintenance of hot water heaters. The life of boilers will be five times as long, and the saving in this respect will be $31,000 annually. $500,000 annually will be saved in the reduction of present loss caused by scale in pipes … Thousands of dollars will be saved in fire salvage … NEW INDUSTRIES MADE POSSIBLE …” Quoted in Artibise, Winnipeg: A Social History of Urban Growth, 1874-1914, 221-222. 85. PAM, William Sanford Evans Papers, MG 14 B 28, Box 5, File 30 a, Sanford Evans to Irene Evans, 24 June 1908. 86. Ibid, File 30 b, Sanford Evans to Irene Evans, 15 July 1908. The fact that the Free Press supported Sanford Evans’ bid for the mayoralty further attests to the political cohesiveness of the elite in the realm of municipal politics. The editor-in-chief of the Free Press, J. W. Dafoe, despite the fact that he was a staunch Liberal, still supported Evans, who was a Conservative. Class, then, seems to have superceded partisan politics in municipal government. 87. Manitoba Free Press, 22 December 1897, quoted in Grover, 3. 88. Winnipeg Telegram, 19 January 1910, 10. 89. Augustus Nanton and R. T. Riley are other examples of businessmen who managed the realty investments of capitalists outside of the region. 90. PAM, William Sanford Evans Papers, Box 5, File 21, H. L. Archer to Sanford Evans, 8 July 1909; Ibid, R. J. Shrimpton to Sanford Evans, 28 February 1910. 92. LL, Manitoba History Scrapbook 5, 57, 26 June 1911. 94. LL, Biographical Scrapbook 8, 70, 19 March 1926. 95. Stobart shot and injured a man on the other side of the river—the man had apparently been swimming in the river. Stobart settled the matter outside of court, paying $700 to the man. See C. S. Riley, 8. 97. Henderson’s Directory, 1890, 882. 98. Artibise, Winnipeg: A Social History of Urban Growth, 1874-1914, 167; The developer of Crescentwood, Charles H. Enderton, applied the following restrictions to any land purchased in Crescentwood: “1. That no dwelling erected upon the lot in question cost less than $3,500, and each house be set back 60 feet from the front street line. In the case of corner lots, the dwelling was not to be closer than 30 feet from the side line. 2. On Wellington Crescent, dwellings were to have a completed value of no less than $6,000, and will be set back 60 feet from the street. 3. On side streets, dwellings were to have a completed value of no less than $4,000, and be set back 60 feet from the street. 4. That there are not be more than one dwelling per lot(s) as sold. 5. That no building, other than those for residential purposes, be erected upon the lot(s).” See Land Titles Office, Caveat, 11677, filed 23 October 1902 quoted in Randy Rostecki, Crescentwood: A History (Winnipeg: The Crescent-wood Homeowners Association, 1993), 24. 99. John Marlyn, Under the Ribs of Death (Toronto: McClelland of Canada,  1990), 68-69. 100. PAM, Augustus Nanton Papers, MG 14, C 85: “Kilmorie, Roslyn Road, 1900-1935,” September 1972. 101. Charles Bell did not live on the south side of the Red River, which was increasingly becoming the residential area of choice for the bourgeoisie, but rather, he still lived to the north of the river on Carlton Street, near the corner of Broadway. While some may disagree as to whether or not this area constituted part of the South End geographically, in terms of class-experience in turn of the century Winnipeg, the area was without question a part of the South End. 102. LL, “Charles Napier Bell,” Vertical File, Winnipeg Free Press, 6 March 1971. 103. PAM, Augustus Nanton Papers, MG 14, C 85: “Kilmorie Roslyn Road, 1900-1935,” September 1972; MacBeth, 63. 104. LL, Biographical Scrapbook 8, 132, 23 February 1928. 105. Schofield, The Story of Manitoba, vol. II, 437. 106. LL, Biographical Scrapbook 8, 70, 19 March 1926. 107. Town Topics, 10 September 1910, 10. 108. See Arthur L. Tunnell, ed., The Winnipeg Society Blue Book and Club Membership Register, 1926-27, 68-71. 109. C. S. Riley, 41, 44-45, and passim. 110. W. L. Morton, Manitoba, A History (Toronto, 1955), 173 quoted in Careless, 243. 111. PAM, Manitoba Club Papers, MG 10, C 25, The Act, By-laws and List of Members of the Manitoba Club, April 1884, 7. 112. The papers of Sanford Evans give evidence of the club’s role in bourgeois life. Evans used the club on a regular basis, and it served various purposes. On one occasion he stopped off at the club with his brother Harry Evans—who was a notable Edmonton businessman—to shoot billiards; then, on another occasion he met with Edison Chamberlain, vice-president and general manager of the Grand Trunk Pacific Railway, to talk business. See PAM, William Sanford Evans Papers, Box 5, File 30 b, Sanford Evans to Irene Evans, 19 July 1908 and File 32, Sanford Evans to Irene Evans, 14 January 1910. Also as an illustration of the club’s importance, Allan Levine has traced the establishment of the Winnipeg Grain and Produce Exchange in 1887 to a conversation—between Nicholas Bawlf, Charles Bell, and Rodmond Roblin—that took place at the Manitoba Club. See Allan Levine, The Exchange, 36-38. For a general description of the Manitoba Club, though an uncritical description at that, see Mary Lile Benham, The Manitoba Club: 100 Years 1874-1974 (Winnipeg: The Manitoba Club, 1974). 113. Wade A. Henry, “W. Sanford Evans and the Canadian Club of Winnipeg, 1904-1919,” Manitoba History 27 (Spring 1994), 3. 115. Augustus Nanton’s speech to the Winnipeg Board of Trade in 1924 reflected the bourgeoisie’s views on immigrant labourers. Nanton spoke of the need to foster the development of loyal British subjects, while pointing to the need to suppress the “teachings” of people from foreign lands going on behind “closed doors”: “My feeling is that it [Winnipeg] will continue to grow … provided the citizens work together, forget all petty differences and see that the boys and girls of today are brought up loyal citizens and loyal British subjects. In my opinion the greatest peril which confronts Canada and especially this city is the teachings we hear behind closed doors. This should be done away with. We welcome all good citizens from foreign lands but if they do not believe in a Christian religion, nor intend to keep our laws they should be asked to return from whence they came.” See PAM, Augustus Nanton Papers, “Speech to the Winnipeg Board Trade,” 16 December 1924. 117. Ibid, 5; C.S. Riley, 27. 118. LL, Vertical File, Charles Napier Bell, “Young Bugler Boy Grows up with Winnipeg,” n.d.
119. This house was built in 1900. see Ibid, Free Press, 6 March 1971. 120. Schofield, The Story of Manitoba, vol. II, 67. 121. There is a collection of papers at the Archives of Manitoba from the Women’s Social Science Study Club of Winnipeg (MG 10 C 50). 122. PAM, Women’s Musical Club of Winnipeg Papers, MG 10 C 7, Box 2, File 14, Women’s Musical Club of Winnipeg, 16th Annual Report, 1914-15, 7. 123. Town Topics, 9 December 1899, 5. 125. Pierre Bourdieu, Distinction: A Social Critique of the Judgement of Taste, trans. Richard Nice (Cambridge: Harvard University Press, 1984), 18. 126. Schofield, The Story of Manitoba, vol. II, 68. 127. PAM, William Sanford Evans Papers, Box 5, File 37 a, Irene Evans to Sanford Evans, 18 April 1915. 128. LL, Biographical Scrapbook 6, 124, Free Press, 13 November 1915. George Galt’s first wife passed away, and he was remarried to Muriel Munsell, daughter of Brigadier General G. Slepford Munsell, in 1917. See LL, Biographical Scrapbook 6, 228, Winnipeg Telegram, 17 January 1917. 129. PAM, William Sanford Evans Papers, Box 5, File 37 a, Irene Evans to Sanford Evans, 18 April 1915. 130. Alieen Kraushar et al., Springfield: 1st Municipality of Manitoba, 1873-1973 (Dugald: Dugald Women’s Institute, 1974), 265. 131. Town Topics, 4 March 1899, 1. 132. PAM, Edith Rogers Papers, Box p.185, File 9, Ned Boyle to Edith Rogers, ? August 1920. 133. Douglas Durkin, The Magpie (Toronto: Hodder & Stoughton Ltd., 1923), 97-98. 134. Town Topics, 2 July 1898, 2. 135. PAM, Augustus Nanton Papers, The Nanton, 29 January 1942. 136. B. M. Greene, ed., Who’s Who in Canada, 1928-29 (Toronto: International Press, Ltd., 1929), 1052. 137. LL, Biographical Scrapbook 8, 103, 12 May 1927. 138. Ibid, 214, Free Press, 3 February 1928. 139. See, Mariana Valverde, The Age of Light, Soap, and Water: Moral Reform in English Canada, 1885-1925 (Toronto: McClelland & Stewart, 1993). 140. PAM, Women’s Musical Club of Winnipeg Papers, Box 2, File 9, W. B. U. Sterling to the Women’s Musical Club of Winnipeg, 6 April 1914. 141. Manitoba Free Press, 25 March 1914, 13. 142. PAM, Winnipeg Board of Trade Papers, 32nd Annual Report of the Winnipeg Board of Trade, 32. 143. Ibid, 36th Annual Report of the Winnipeg Board of Trade, 48. 144. Artibise, Winnipeg: A Social History of Urban Growth, 1874-1914, 188-89. 145. Royal Commission on Industrial Relations, Evidence, Winnipeg, 12 May 1919, 1528. 148. Bellan, 151-52; Levine, The Exchange, 105. 149. Royal Commission on Industrial Relations, 1505. 151. PAM, Thomas R. Deacon Papers, MG14 B1, Winnipeg Tribune, 10 November 1971. 152. Monetary Times, 17 January 1930, 5; Tom Travers, “Security Without Regulation,” in The Consolidation of Capitalism, 1896-1929, eds. Michael S. Cross and Gregory S. Kealey (Toronto: McClelland & Stewart Ltd, 1983), 28; Monetary Times, 24 February 1928, 38; Industrial Canada, January 1930, 210. 154. Monetary Times, 11 January 1929, 76; Monetary Times, 2 March 1928, 23; Industrial Canada, December 1929, 121; LL, Biographical Scrapbook 8, 220, Winnipeg Tribune, 14 April 1930. 156. Greene, ed., Who’s Who in Canada, 1927, 169; Greene, ed., Who’s Who in Canada, 1938-39 (Toronto: International Press Ltd, 1939), 1011; Greene, ed., Who’s Who in Canada, 1953-54 (Toronto: International Press Ltd, 1954), 147-148 and 701-702; LL, Biographical Scrapbook 10, 43, Winnipeg Tribune, 4 December 1948 and 145, Winnipeg Tribune, 31 May 1950; Winnipeg Tribune, 6 July 1959; Winnipeg Free Press, 6 July 1959; Monetary Times, 30 May 1924, 26; Peter C. Newman, The Establishment Man: A Portrait of Power (Toronto: McClelland & Stewart, 1982), 20-23; Bellan, 253. Canadian Breweries Ltd gained control over the Drewrys through what appears to have been its subsidiary, The Carling Brewing Company—George Montegu Black Jr. was vice-president of the company. 158. Graham D. Taylor and Peter A. Baskerville described the consolidation of the banking business: “Between 1890 and 1920 the number of chartered banks shrank from 41 to 18, while the survivors extended a network of more than 4600 branches across the Canada. Smaller proprietary banks serving local communities steadily gave way to the national joint-stock enterprises that could more readily ride the fluctuations in the business cycle.” See Graham and Baskerville, 250. 159. Monetary Times, 24 July 1925; Castell Hopkins, Canadian Annual Financial Review of Public Affairs, 1925-1926 (Toronto: The Canadian Review Company Ltd, 1926), 315-16; Manitoba Free Press, 24 July 1925, 10. 160. Greene, ed., Who’s Who in Canada, 1928-1929 (Toronto: International Press Ltd, 1929), 10. 161. Greene, ed., Who’s Who in Canada, 1962-63 (Toronto: International Press, Ltd, 1962), 329-330; Hugh Fraser, Herbert E. Barnett and Edward White, Who’s Who in Canada, 1966-68 (Toronto: International Press Ltd, 1964), 131. 162. PAM, Winnipeg Board of Trade Papers, Greater Winnipeg Board of Trade, 1924-25: Annual Address of the President, 8-9. 163. Levine, The Exchange, 40. 164. Who’s Who in Canada, 1927, 469; Who’s Who in Canada, 1938-1939, 1369. 165. Levine, The Exchange, 148. For a list of the mergers that took place in the grain trade see Charles W. Anderson, Grain: The Entrepreneurs (Winnipeg: Watson & Dwyer Publishing Co, 1991), 186-189. 166. Artibise, Winnipeg: An Illustrated History (Toronto: James Lorimer & Co, 1977), 122. 167. PAM, Edith Rogers Papers, Alex Burness to Edith Rogers, 27 November 1929. 168. Greene, ed., Who’s Who in Canada, 1938-39, 1366.